This is the struggle of the main character, Josey, from The Sugar Queen by Sarah Addison Allen. She is a 27-year-old woman still living under the thumb of her unloving mother, hoarding snack cakes and travel magazines in her closet, and wishing things would change but not knowing how to make them. One night, however, when a woman appears in her closet, Josey’s life starts to spiral out of control and she doesn’t know if that’s a good thing or a bad one. She’s forced to venture out of her room and open her eyes to the world around her, and it is full of shocking discoveries that never seem to end. The Sugar Queen has suspense, drama, romance, and a little bit of the supernatural. This is a book that is so engrossing that you might end up devouring it in one day – I did. Visit The Kitchen Reader blog for a list of the other members’ reviews of this book. 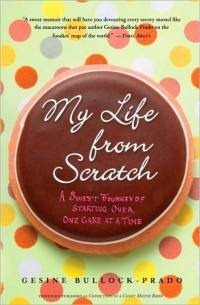 What thought kept going through my mind as I read Gesine Bullock-Prado’s memoir My Life from Scratch: A Sweet Journey of Starting Over, One Cake at a Time? It was this: bitter much? Gesine is Sandra Bullock’s sister and former president of her production company. Unsatisfied with her career in Hollywood, she decides after having a sort of “waking dream” that she should be baking instead to bring happiness to others. The memoir is sweet with memories of her love for sugar and her German and Southern families’ influence on her baking style. There are recipes included along with funny anecdotes about running a bakery. It is an inspiration to all of us who have ever dreamed of owning our own bakery. But it is also full of bitterness about being considered Sandra Bullock’s less attractive sister, the “Sand-me-down” clothing, having to be the go-between for all the crazed fans, and the fact that no one can pronounce her name correctly (how about letting us know at the beginning of the book how to pronounce it so we don’t spend half the time saying it wrong in our heads, Ja-zeen?). This is a story of someone trying to find herself, to break free from the shadow of a super-famous older sister and evolve into her own person. It just happens to be through baking that Gesine finds her way, and she puts it all on the table for us to read. *This Kitchen Reader selection was chosen by Shelley at My Little Chickadees. See what the other members thought about the book on The Kitchen Reader blog. I’ve been on something of a “food journey” lately, kicked off by my “concern of keeping my family fed” as Barbara Kingsolver pledges in Animal, Vegetable, Miracle: A Year of Food Life, and fueled by the eagerness to be sure I gave them the most healthful and sustaining foods possible. Little did I know what an eye-opening journey it would turn out to be. Somewhere in the back of my mind I had a feeling there were problems with the way our food system worked, but I had conveniently put it there thinking there was nothing I could do about it. But it wouldn’t stay put. That feeling crept into my conscious when I heard about another salmonella or e-coli outbreak or when I read articles about the amount of residual pesticides in foods. So instead of ignoring the facts I faced them. Being the provider of food for my family and also someone who really loved to cook and eat, I felt that there must be a way I could use those roles to make some kind of difference. I began to research things such as organic produce and hormone and antibiotic-free meat and dairy – were these things too good to be true or just some popular fad? I stumbled across Lia Huber’s Nourish Network website where these issues are really broken down in a way I could understand. Wanting to further my understanding and knowledge, I began Lia’s My Nourish Mentor program where I’m being guided through the process of delving into the good, bad and ugly of our current food system and fleshing out my priorities in my relationship with food. Looking for a kick-start yourself? Watch Food, Inc. In one of those funny coincidences our online book group The Kitchen Reader has made each of its last three choices books that are particularly relevant in my quest for knowledge about our food system. The first, Mark Bittman’s Food Matters: A Guide to Conscious Eating, focuses on the effect industrial meat production has on the environment (“In terms of energy consumption, serving a typical family-of-four steak dinner is the rough equivalent of driving around in an SUV for three hours while leaving all the lights on at home”). His point is not to give up meat, but to eat less of it from better, preferably local, sources, and fill the empty space on your plate with plants – vegetables, fruits, and grains. The culmination of all this information I found in this month’s selection, the book I chose for our group to read. In Animal, Vegetable, Miracle, Barbara Kingsolver does what most people on a similar food journey would like to do – moves to a farm with her family and lives only on local, seasonal food grown on her land or on nearby farms. Her husband and two children, one a teenager and the other much younger, agree to make this their goal for one year to see if it can be done. As Kingsolver recounts in a lighthearted but at the same time serious tone the month-by-month progress her family makes, she addresses her reasoning behind making the choice to live locally – to avoid harmful chemicals in their foods, to bring back heirloom varieties of produce and meats, to support other local farmers being weeded out by industrialization, to protect the environment, and to raise children to do the same – and along the way “keeping her family fed”. I’m voting for change with my food dollars , one small step at a time. Here’s how you can get started, too. 1. Purchase some locally grown, seasonal produce from a farmers market or farm that offers a CSA (Community Supported Agriculture). 2. Reduce the amount of meat you prepare by half, and look for the most naturally-grown, local meat you can find. 3. Plant something – in a pot, in the yard, anywhere. ‘Twas the month before Christmas and all of the weeks are spent visiting family, trimming everything, sending out Christmas cards, baking, attending school plays and parties, shopping, trying to squeeze twenty hours of continuing education in before the end of the year (oh, that’s just me) . . . The children are doing their best to be good, their Elves telling Santa if they’ve done what they should. And mama’s getting frazzled, and papa’s freakin’ out, ’cause the smaller the present, the bigger the amount. But a little Christmas treat from the kitchen can help, and we can all rest a bit and remember what this time’s all about. This recipe is one my mother used to make every Christmas growing up – it most likely came from a church cookbook. If you love dates, you’ll love these. If you don’t, you’ll love these anyway. Melt butter and sugar in a medium sauce pan over low heat. Add egg and stir until thoroughly incorporated. Add dates, nuts and vanilla and bring to a boil. Reduce heat to low and simmer 10 minutes. When cool enough to handle, roll into bite-sized balls and roll in coconut or confectioner’s sugar. Check out the Kitchen Readers and their favorite Holiday cookies here.